Knysna (/ˈnaɪznə/; probably from a Khoisan word meaning "place of wood" or roughly "fern leaves") is a town with 68,659 inhabitants as of 2011 in the Western Cape Province of South Africa and is part of the Garden Route. It lies 34 degrees south of the equator, and is 55 kilometres east from the city of George on the N2 highway, and 33 kilometres west of the town of Plettenberg Bay on the same road. Little is known about the indigenous inhabitants of Knysna, the Khoikhoi. The area east of present-day George was separated by high mountains and deep gorges, making it virtually inaccessible to European travellers. The SS Agnar tows an unknown sailing ship into Knysna Harbour in 1910. Nevertheless, the first Europeans arrived in the area in 1760, and the farm Melkhoutkraal (literally translating from Afrikaans as 'milk wood kraal’) was established on the eastern shore of the Knysna Lagoon. Stephanus Terblans, the first European farmer to settle in the area, was given a loan permit to farm here in 1770. Upon moving to Knysna George Rex, a British-born entrepreneur credited as being the founder of Knysna, acquired the loan rights to Melkhoutkraal in 1804 and later, in 1816, to the farm Welbedacht, which he renamed Eastford. He gave 80 acres (32 ha) of Eastford to the Colonial Government, on which the Royal Navy established the township of Melville. Rex’s properties were sold when he died in 1839. In April 1817, the transport brig Emu, belonging to the Cape Town Dockyard, was the first European vessel to enter the Knysna heads. She struck a rock, now known as Emu Rock, and was holed. Her crew ran Emu ashore to prevent her sinking. In late April HMS Podargus arrived to render assistance. After surveying the area, Podargus sailed safely into the Knysna and retrieved Emu's cargo. The next major settler in Knysna was Captain Thomas Henry Duthie, who married Caroline, George Rex’s daughter, and bought a portion of the Uitzigt farm from his father-in-law which Rex had named Belvidere. The construction of a small Norman-style church was commissioned by Duthie on his property, and was consecrated in 1855. The settlement’s population grew slowly, and Englishmen such as Henry Barrington and Lt. Col. John Sutherland, who established the settlement of Newhaven on a portion of purchased land, settled in the area. At the time, Knysna was a field cornetcy of Plettenberg Bay within the Magisterial Division of George. In 1858, Knysna became a separate Magisterial Division, new stores and accommodation facilities were opened, and Knysna became the new commercial centre of the region. On their way to New Zealand, the Thesen family who were travelling from Norway fancied the little hamlet of Knysna so much that they decided to stay, bringing with them their knowledge of commerce and sailing. Soon, timber was being exported to the Cape from the vast areas of forest surrounding Knysna, and a steam sawmill and small shipyard were established. Later, these were relocated to Paarden Island, later known as Thesen's Island. In 1878, an important discovery was made in the area. A gold nugget was found in the Karatara River, near Ruigtevlei. Soon fortune hunters from all over the world arrived at the Millwood Forest in search of gold, and Millwood grew into a bustling town. 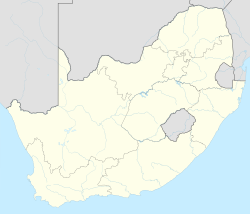 Millwood was declared a gold field, the first in South Africa. However, soon not enough gold was being recovered to sustain a growing town, and the mining industry in the area collapsed. Some miners relocated to Knysna, bringing their little homes with them. One of the houses, known as 'Millwood House', now functions as a museum. By 1880 over 1000 people had settled in Knysna. In 1882, the settlements of Newhaven, Melville and the "wedge" of land between the two villages were amalgamated to form the municipality of 'The Knysna', named after the Knysna River. Knysna's timber industry peaked when George Parkes arrived from Britain and saw the opportunity to use the hardwoods of the Knysna Forest for export to elsewhere in the country, and even overseas. He established the Knysna Forest Company, later renamed Geo. Parkes and Sons Ltd., which is still trading to this day. The town is primarily built on the northern shore of a large warm-water estuary, known as the Knysna Lagoon, which is fed by the Knysna River. The estuary opens to the ocean after passing between two large headlands. These are popularly known as "The Heads", and have become infamous due to the loss of boats and fishermen passing through their treacherous and unpredictable waters. The Paquita, a German vessel, sank on the eastern side of the Knysna Heads in 1903. Near them are geological formations, known locally as "The Map Stones." To the north of Knysna, Afro-Montane or temperate rainforest covers the hilly terrain for 20 km until changing to fynbos or macchia high in the Outeniqua Mountains. The eastern head is heavily developed, while the western head is a private nature reserve, formerly owned by teacher and television presenter William Smith. which he inherited from his father, famed ichthyologist J. L. B. Smith. Knysna has an oceanic climate (Cfb in the Köppen climate classification). Summers are hot and winters mild to chilly. During the summer, the average maximum temperature reaches about 25 °C (77 °F) and rarely goes above 30 °C (86 °F). The average maximum temperature during the winter months ranges in the area of 16 °C (61 °F) to 17 °C (63 °F). Knysna has one of the richest rainfall percentages in South Africa with the wettest time of year being between June and August. Knysna stays green in all seasons, and its temperate climate makes it a tourist destination all year round. The town is a popular destination for both tourists and senior citizens entering retirement, especially among the British and former expatriates due to the year-round warm climate. Recently, the town has also become a preferred destination among golfers, as the town boasts several world class golf courses, including Pezula Golf Course, Simola Golf Course and the well established Knysna Golf Course situated on the lagoon. It is near the towns of Plettenberg Bay and George, where there are airports. Knysna is also home to Mitchell's Brewery although the company no longer brews beers in the town. The forest, rivers, estuary, and ocean surrounding the town are dotted with hiking trails and plenty of opportunities for outdoor activities. Hikers, runners, kayakers, swimmers, and fishermen are known to be particularly fond of Knysna. Knysna hosts a variety of annual events, which draw local and international visitors alike. Such events include the Pick n Pay Knysna Oyster Festival in late June and/or early July; the Pink Loerie Mardi Gras at the end of April and/or beginning of May; the Knysna Speed Festival takes place in the first week of May, the highlight of the week being the Simola Hillclimb, currently sponsored by Jaguar South Africa. The Rastafarian Earth Festival takes place at the end of July, celebrating Rastafarian religion, culture and lifestyle. The Pick n Pay Knysna Oyster Festival, held annually in late June/early July, is the town's biggest event. The duration of the festival is ten days. It was first held in 1983. Approximately 200,000 oysters are consumed over the 10-day period. Many sporting activities take place, such as rugby, golf, bowls, squash, cycling and marathons. The Knysna Forest Marathon and Half Marathon, as well as the Rotary Cycle Tour, draw many sporting enthusiasts to the town. The best-known hillclimb event in South Africa is held annually in early May during the Knysna Speed Festival, currently known as The Jaguar Simola Hillclimb. It is a three-day event, with Classic Car Friday reserved for cars built prior to 1980 and restricted to 60 entries. The King of the Hill Challenge (limited to 84 entries), for unrestricted cars in various classes, takes place over the weekend. The Saturday is for practice and pre-qualifying, while Sunday features the "hot" cars taking on final qualifying and the final runs. The course length is 1.9 km (1.2 mi) up Simola Hill. It is very fast with the 2016 winning average speed being 176.991 km/h (109.977 mph).. 2017 will be the eighth running of the event which was founded in 2009. There was no event in 2013. The Knysna municipality assumed a coat of arms in 1959, and registered them with the Cape Provincial Administration on 24 June 1960. The arms, which were designed by Ivan Mitford-Barberton, are: Quarterly, I Or a white horse's head couped at the neck proper; II Azure a fern frond in bend sinister Argent; III Azure a yellowwood tree Or; IV Or an elephant's head caboshed proper (in layman's terms: the shield is quartered, 1 a white horse's head on a gold background, 2 a silver fern frond on a blue background, 3 a yellowwood tree on a blue background and 4 an elephant's head on a gold background). The crest is a sailing ship, and the motto Concilio et prudentia. The Knysna divisional council (the local authority for the rural areas outside the town) assumed a coat of arms in 1961 and registered them with the provincial administration on 28 July 1961. The arms, designed by Schalk Pienaar, were: Per saltire, I Or on a mount Vert a stinkwood tree proper; II & III Argent three bars wavy Azure; IV Vert the brig Knysna proper the sails charged with two lions rampant Gules and pennants flotant Azure. In layman's terms: the shield is divided into four sections by two diagonal lines, the top section displays a stinkwood tree on a golden background, the left and right sections display three wavy blue stripes against a silver background, and the bottom section displays a brig named 'Knysna' with red lions on the sails and a blue pennant flying from the mast. The motto was Pulchra terra Dei donum. ^ "MARK WILLEMSE NEW EXECUTIVE MAYOR OF KNYSNA". ^ a b c d "Main Place Knysna". Census 2011. ^ du Plessis, E.J. (1973). Suid-Afrikaanse berg- en riviername. Tafelberg-uitgewers, Cape Town. p. 250. ISBN 0-624-00273-X. ^ a b Asiatic Journal and Monthly Miscellany, (1818), Vol. 6, p.317. ^ Horsburgh (1826), Vol. 1, p.196. ^ NDLOVU, RAY (8 June 2017). "Insurers expect claims to rise on Cape storm and fires". Business Day. Retrieved 2017-06-12. ^ de Villiers, James (11 June 2017). "#KnysnaFire: death toll rises". News24. Retrieved 2017-06-12. ^ Head, Tom. "Forensic investigator believes arson is the cause of Knysna fires". www.thesouthafrican.com. Retrieved 2017-06-12. ^ "The Jaguar Simola Hillclimb". Retrieved 2012-10-15. ^ Cape of Good Hope Official Gazette 3034 (24 June 1960). ^ Cape of Good Hope Official Gazette 3092 (28 July 1961). Horsburgh, James (1826) India Directory, Or Directions for Sailing to and from the East Indies, China, New Holland, Cape of Good Hope, Brazil and the Interjacent Ports. 3. Ed, Vol. 1. (Kingsburg). 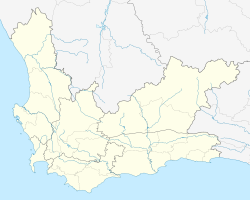 Wikimedia Commons has media related to Knysna. Wikivoyage has a travel guide for Knysna.